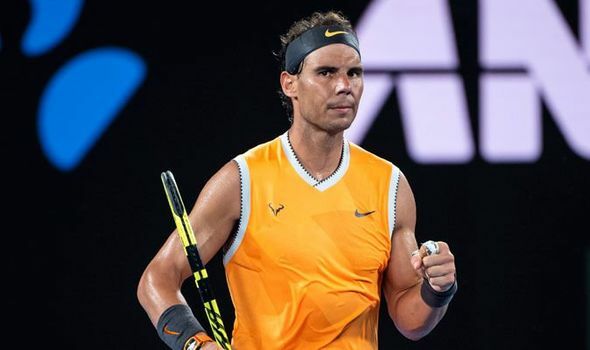 Rafael Nadal, a 17-time Grand Slam champion reached the third round of the Australian Open with a straight victory over world No.46 Mathew Ebden of Australia. Second seed Rafael Nadal beat Ebden 6-3 6-2 6-2 in just under two hours and minutes after the match he had the Rod Laver Arena crowd in hysterics. American tennis icon John McEnroe’s interview with Nadal was interrupted by an admirer, eliciting a classic response from the King of Clay. “You drinking some tequilas or what?” Nadal said to crowd member. Earlier McEnroe quizzed Nadal about his pedantic approach to water bottles as the world champion is very selective about how his water bottles are arranged during the games, much to the amusement of tennis fans around the world. The 32-year-old said he doesn’t arrange them similarly at home or at practice courts only when it matters. Nadal is all set to become the first man in the Open era to win each of the four Grand Slam titles at least twice. “He is not an easy opponent”, Nadal told the reporters after the match. “I started a little bit slow especially on the return side, serving I think was good from the beginning itself. I played a solid match and I am happy with the way I served. It is an honor to play here, it was a great atmosphere”.